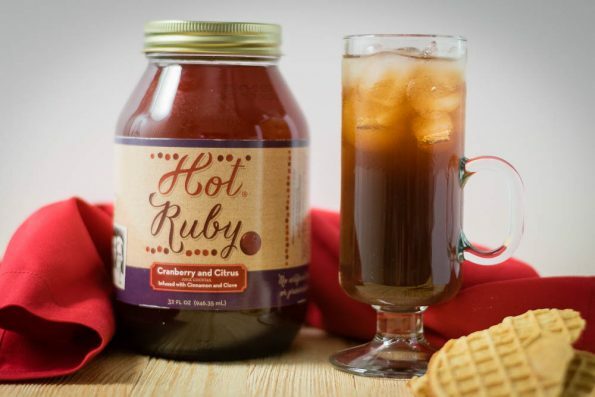 Originally created by the late Ruby Faye, Hot Ruby is made from a special family recipe. Unlike typical cider, this drink is made out of cranberry, pineapple and citrus juices along with an exquisite blend of spices. Not only will the house smell delicious while it’s simmering on the stove, but it will warm the souls of your guests with its goodness. What makes Hot Ruby different from other ciders? We recently received samples of Hot Ruby and to be honest, we had no idea what to make with it. Cocktails felt too safe and too obvious. We wanted to try a non-alcoholic (shocking right?) recipe. Sometimes the adage “Keep it simple stupid” is the best mentality to have while creating a recipe. We ended up putting it straight into our coffee on a whim and as fate would have it, it worked! We are huge coffee drinkers over here at Geeks Who Eat. That being said, we aren’t crazy about overly sweet coffee. That is where Hot Ruby comes in. It is a great way to give your coffee a little oomph without going crazy with the sweet. Mulled cider not your thing? Serve the coffee hot with a tablespoon of Hot Ruby per 8 oz. Want a new refreshing afternoon pick me up? Serve it cold with the same measurements. The story of Ruby Faye starts in the 1950’s when she and her husband Roy established their home together on a South Plain Texas farm. Her delicious twist on cider would fill her home with its irresistible scent. Made with fresh cranberries and tons of love, it instantly became a family tradition during the holidays. *The Geeks were given comped items to facilitate this write-up; We were also provided information about Hot Ruby. All opinions are wholly our own. View our Disclosure Policy for more info.